Andrew Odlyzko, a professor at the University of Minnesota, thinks that price discrimination might not be in telecoms companies’ interests after all. Unlike on canals, toll roads and so forth, internet capacity is abundant. Internet service is therefore a commodity. Simpler, flat-rate pricing, he argues, is likely to increase usage: discrimination would turn some users away. The full thesis is here. The new wi-fi phones are coming. 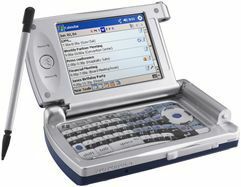 Here’s a look at the Motorola MPx which comes with tri-band GSM/GPRS, Bluetooth, Wi-Fi, 1.3Megapixel camera and a dual-hinge case that can make it a palmtop or a clamshell phone. Here are multiple photos of it, but the review is in French. And here’s another view of it with a little about its features from PocketPCCentral. 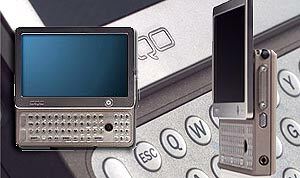 The OQO – a product that was nothing more than vapourware like ages ago – is finally out. The verdict – judging from reviewers – is that perhaps Model 1 is a dud. Do we need to wait till Model 3 before they actually do user feedback? Seems handy enough from the video though. I can imagine using it to load up on photos that I have taken with a Sony Cybershot when it maxes out, then handing it around at weddings for guests to view. Sadly, the display is only 800-by-480-pixels, doesn’t tilt and the HDD is only 20GByte. 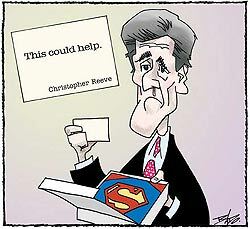 Fancy seeing some political cartoons? Cagle posts them all on one site. Site can be wretchedly slow sometimes, but it’s all there. Ever wondered who’s watching and linking to your blog/site? Here’s a new tool from Shanti Bradford the inventor of Popdex who just happens to be a guy and isn’t Indian. Can a website save your life? Apparently in the case of Australian journalist John Martinkus it can. His executive producer at Australia’s SBS network, Mike Carey, said Google probably saved freelance journalist Martinkus. Even terrorists use Google for background checks. Try typing your name and do some ego-surfing. See what pops up. If you’re a journalist — like me — the results can be the basis of a website. Then go here to read what Sreenath Sreenivasan suggests. And see what others have done. Sreenath Sreenivasan sent me this hilarious Flash cartoon. Along with Jibjab.com and pioneering work by Mark Fiore, I think increasingly we will receive more news via Flash which seems to be the platform of choice for such political humour. Can’t decide on Kerry or Bush? How about Amitabh “Dishoom” Bachchan? “it is reasonable and even prudent to assume that the Internet is vulnerable to a “take down”. Now a professor at the Helsinki University of Technology, Hannu H Kari suggests that the Internet would collapse in 2006. His premise is that “there are many bad people who want to create chaos on purpose” and that spam and viruses were the main culprits. No, the sky isn’t falling. Perhaps Prof Kari is overstating the facts but his warning shouldn’t be taken lightly. I do believe that there is validity that a concerted distributed denial of service attack — for whatever malicious reason — can cause a net blackout. Then what? Will we get up again? Shades of Y2, maybe? Maybe not…We will see. I spend way too much time on Blogdex. Blogdex is an MIT MediaLab creation that crawls blogs and rates the most linked links. It’s my quick-fix news filter. I do not need to go elsewhere. I continually remain surprised at what goes up there. 1. Making fun of George“you forgot Poland” Bush. 2. The sequel to JibJab’s This Land is Your Land animation. 3. How to switch off …and on any TV in the world. 4. Bush’s use of a child’s loss of her mother in 9/11 for some viral marketing. 5. William Shatner making an album with Ben Folds of Ben Folds Five. 6. A flatscreen TV that sent out an international distress signal and had his flat swarming with a contingent of local police, civil air patrol and search and rescue personnel. 7. A band called “Kings of Convenience”. 9. What everyone doesn’t know about Mary Cheney. 10. How Bush actually believes he is God’s chosen one. Go there, get hooked and don’t blame me for it.